The Instagram revolution is hitting the shoe rack – in the form of personalized sneakers form Adidas. The company is set to launch a new line of personal sneaks that can be transformed using images from your Instagram feed, aka, the world’s giant Selfie Stream. While most users on Instagram are streaming images of their lunches, a pair of Adidas emblazoned with your matching face might be the perfect fashion statement of the year. Naturally, the athletic gear company made the app announcement on Instagram. ARE YOU READY? 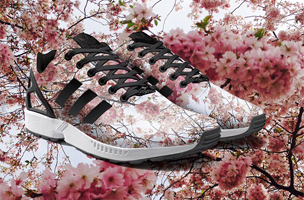 Take the #zxflux to the next level with the ultra innovative photo print app from#miadidas. Print your favourite photos straight on to one of 2014’s hottest silhouettes and make a statement on your sneakers like never before. Rolling out on iPhone and Android from August 2014. The possibilities are limitless. Boomf is offering the most delicious printing service on earth – gourmet marshmallows with personal Instagram images. It’s a temporal, sugary reminder of your photographic captures that would have collected digital dust in the ever-growing bins of Instagram photos.